TABASCO® brand SWEET & Spicy Pepper Sauce, divided --- 5 Tbsp. Green onion, minced --- 2 Tbsp. Sesame oil, not toasted --- 1 Tbsp. Hot house cucumbers, whole --- 2 ea. Rice wine vinegar --- 1 tsp. Whole-leaf spinach or kale, large leaves --- 8 ea. Cook buckwheat noodles until done. Strain and rinse under cold water. Allow to dry on a sheet pan lined with parchment paper. Mix tuna with 2 Tbsp. TABASCO® SWEET & Spicy Sauce, ginger, green onions and sesame oil; keep cold. Peel and deseed cucumbers. Place into a blender and puree until smooth. Add rice wine vinegar and keep cold. Blanch spinach leaves for 10 seconds and shock in an ice bath; dry on paper towels. Lay out four 18"x24" double layers of plastic wrap; lay one-quarter of the buckwheat noodles in a circular pattern in the middle of each. Place two blanched spinach leaves in the middle of each mound of noodles. Place one-quarter of the ahi tuna mixture onto each. Meet the corners of the plastic wrap packets above the noodles, spinach and tuna, pushing the air out and tightening into balls. When air is removed, spin filled packages to form tight balls. Place noodle balls into refrigerator for 30 minutes to set. Fry noodle balls until crispy. Spoon pureed cucumber/rice wine vinegar mixture onto the bottoms of four plates and drizzle each with remaining 3 Tbsp. TABASCO® SWEET & Spicy Sauce. 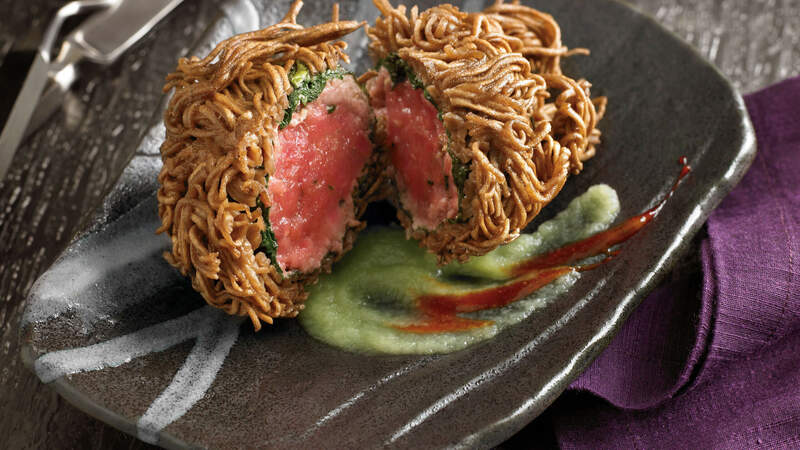 Slice each crispy buckwheat-tuna ball in half, and place over sauce on each plate, then serve.